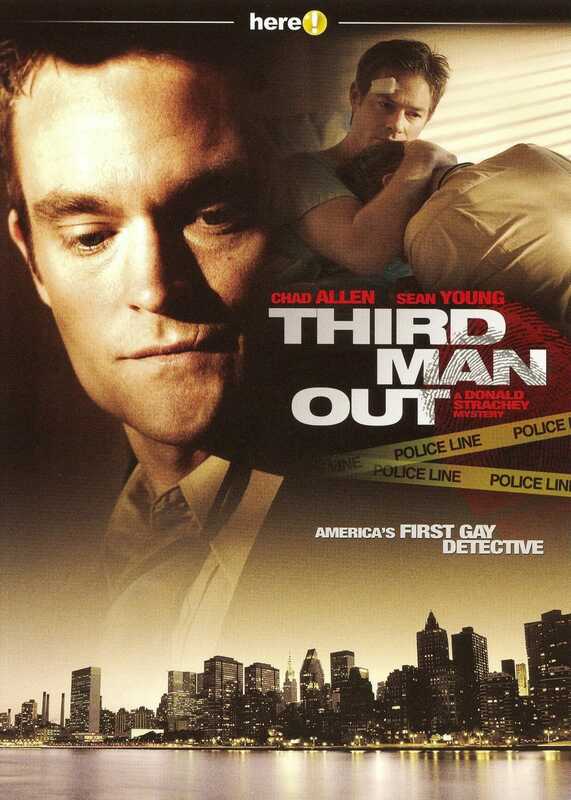 As part of my movie watching for TGGeeks I’ve decided to take a look at movies for the LGBTQ community that have probably flown under most people’s radar, and this time I’m going to examine the first of the Donald Strachey gay detective movies, Third Man Out. Donald Strachey is a private investigator, with something of a past that he likes to keep hidden. One thing that he doesn’t hide is that he’s openly gay, and living in Albany NY allows him the right to marry his longtime partner, Timmy Callahan, who is a legislative aide to New York State Senator Glassman. Their marriage is common knowledge in the LGBTQ community, as is the fact that Donald is the first gay P.I. compliments of an article that was done on him in The Advocate. Donald is also just as much of a wannabe Colombo as Timmy is a poster boy for Brooks Brothers. The two of them bump into each other at a hospital in what initially appears to be entirely separate circumstances. Timmy is there because the senator wishes to pay her respects to a Catholic Bishop who is in the hospital following some injury, and Donald is there because he’s just learned of a new client that wishes to hire him. However Donald isn’t entirely enthralled when he learns that this new client is an extreme gay activist named John Rutka, who has earned a dreadful reputation by printing a semi-regular news article that would “out” gay men hiding in the closet while openly acting against the LGBTQ community. For this reason Rutka is now in the hospital as apparently someone has made an attempt on his life. Despite all this Donald doesn’t want anything to do with the case because of the lives he feels that Rutka has destroyed, whether they deserved it or not. It isn’t until it is reported on the news that Rutka has been murdered that Donald decides to take the case as a favor for Rutka’s surviving life partner, Eddie Santon. His investigation takes him through Rutka’s records possibly suggesting who might be the next person to be on Rutka’s hit list. As he starts down that avenue he finds himself examining different threads that initially appear to be all disconnected and separate from one another, only to find that they are more connected than he ever suspected, which could lead to a scandal that might bring down someone powerful in the city of Albany. One of the great things about this movie is the tone that it takes. It was a wonderful reminder of the NBC Sunday Night Mysteries from the 70’s (I am over 50!). Donald wears a trench coat much of the time and drives a real piece of junk car. His arrogance at the way he almost bullies charms himself into a situation makes him one of those P.I.’s that police detectives usually despise. Nonetheless, Donald has a tenacity about him, which undoubtedly is formed by aspects of his past. Because of this, despite whatever people may think about him personally, he does end up with the reputation of getting the job done. 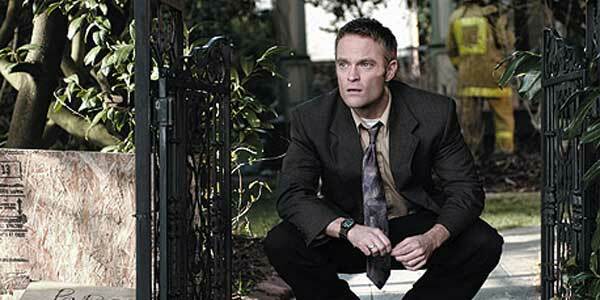 This series stars Chad Allen as Donald, and perhaps he was chosen because of Allen’s own past after coming out as gay. I remember reading news items about Allen having difficulty finding work after he came out, which would be absolutely tragic if true because Allen has always been a consummate actor. I remember watching him in the NBC series Our House as David Witherspoon and finding him to be a capable actor, but it wasn’t until a 4thseason episode of Star Trek: The Next Generation where he played an orphaned human raised by enemy aliens that I really started to see some serious acting chops on this young man. Admittedly he fell off my radar during his time on Dr. Quinn, Medicine Woman, as that was a show I had no interest in whatsoever. I then heard about him coming out and that was it until I learned of this “Donald Strachey” mystery series he was filming. I was more than pleased to see what an accomplished actor he had become. His work on the show almost makes the story secondary in terms of what to look for. His performance is totally spot on making this movie great fun to watch. Then there is Timmy Callahan as played by Sebastian Spence. 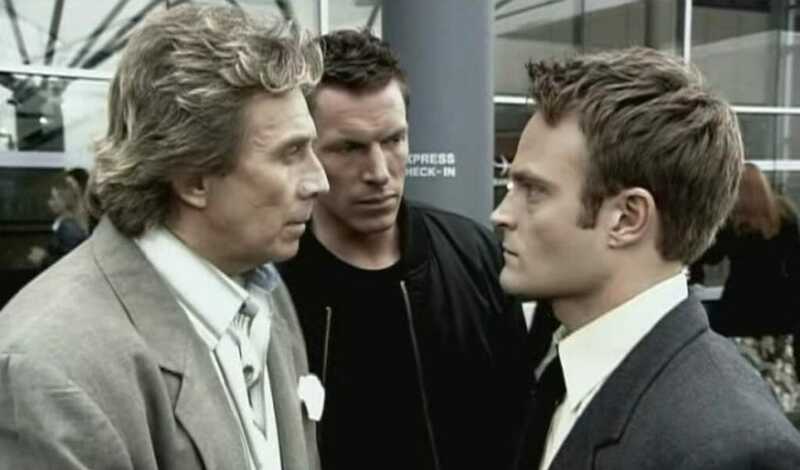 Seeing Spence was probably the biggest surprise for me, as my introduction to him was as Cade Foster, the human hero fighting against an extra-terrestrial invasion on Earth on the sci-fi series First Wave. Cade is nothing like Timmy. In fact Spence would show up in a host of other sci-fi properties (turns out Spence is a big sci-fi fan), and each performance is completely unique, which proves the quality of Spence’s skills as an actor. In Third Man Out Spence has given the character of Timmy a quality that is near impossible to do. He has given Timmy some of the characteristics that can easily be found in many gay men (but not me), yet at no time does Spence turn him into some sort of caricature. The only other straight actor I have ever seen pull this off is Patrick Stewart as Sterling in the movie Jeffrey. Spence finds that realism necessary that helps make Timmy come alive. Yes, there are some familiar elements to the character that some people might pick out. Timmy loves martinis, he dresses really sharply, even when relaxing in his beautiful home that he shares with Donald, and we even see the two of them enjoying a night out at very posh nightclub. Timmy has a certain lighthearted sarcasm that he likes to dish out every now and then, but Spence also shows what a big heart Timmy has, especially when it comes to his husband Donald. Therein lies the magic of this movie. While the mystery is enjoyable to watch, especially to see how Donald has to use every bit of ingenuity to solve it, the pure heart and soul of this movie is this wonderful relationship between Donald and Timmy, and that magic is made possible because of the performances between Allen and Spence. 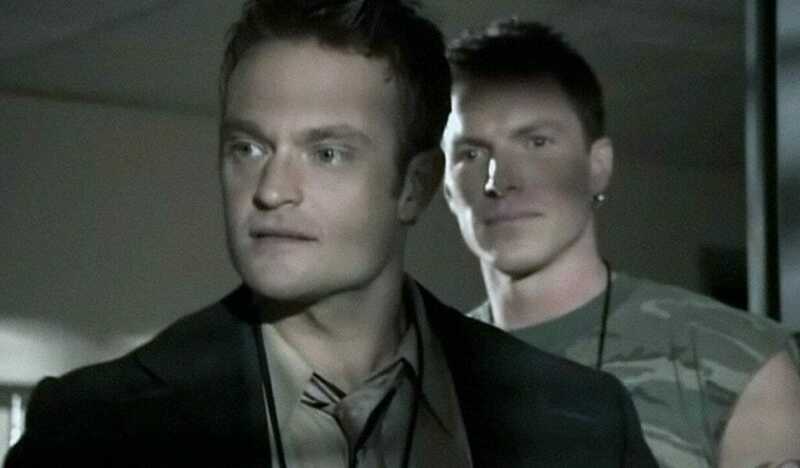 Putting two outstanding practitioners of the acting craft in a scene together always makes for the best scene chewing imaginable, and these two are so good I actually forgot at one time that I was looking at a performance with one actor who is gay and another actor who is straight. Let me say right off that I intensely dislike having to make those types of identifications towards actors. I would rather praise Allen and Spence on the strength of their performances and focus on that. However, given that they play a gay couple very much in love, I only bring this up to further drive home the point at the quality and commitment of their individual performances, especially when they are sharing a scene together. As for the story, this has all the qualities of the best type of mystery that Agatha Christie could possibly dream up. In other words, I wasn’t able to solve it. Even watching it a second time I had to swallow my pride and admit that I am nowhere near clever enough to have unraveled this particular puzzle. On the other hand, I found that it didn’t matter. The mystery is compelling enough to keep me interested, but the real icing on the cake are the performances of this cast, especially that of Allen and Spence. My only sorrow is that there were only 4 movies of the Donald Strachey mysteries ever made. The odds of seeing a reunion of these actors, revisiting these incredible roles, is something that we will probably never see again in terms of any new work. Nevertheless, I am delighted that their performances as Donald Strachey and Timmy Callahan have been preserved in the form of these four films, and the strength of their performances also gives this movie (and hopefully the remaining three) incredible re-watchability. If you’re looking for a fun mystery that caters to the LGBTQ community, that also has a positive message with positive role models, then by all means take a look at Third Man Out. Third Man Out can be watched on HereTV. Your thoughts and opinions are important to us, and if this is your first time visiting please be sure to read the Privacy / Terms and Conditions Of Use.